We provide a number of different septic services to help you maintain your septic system in Plant City, FL. Septic Services in Plant City – You need someone in the Plant City, Florida area who can take care of all your septic system’s maintenance and repair needs with professionalism and efficiency. For this reason, you need us at Lee Kirk & Sons Septic. Septic tank pumping – Having your septic tank pumped out on a regular basis is one of the most important things you can do for your septic system. 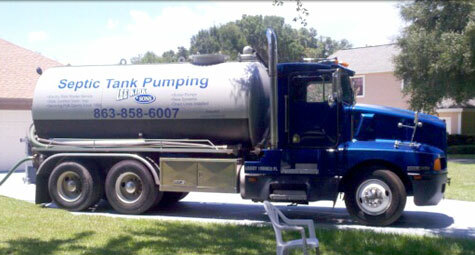 If it’s been a while since your septic tank was pumped, give us a call. Septic tank cleaning – Letting us clean out your septic tank ensures that leftover sludge in your tank doesn’t compromise the overall efficiency of your system. Septic tank installations – We will install your new septic tank correctly the first time so that it performs efficiently and effectively for many years to come. Septic repairs – Whether your sump pump malfunctioned or your drain field is in disrepair, we are here to help you out. Our septic services are complemented by a commitment to your specific needs and state-of-the-art technology. At Lee Kirk & Sons Septic, we strive to stay on top of the latest technologies in the septic industry in order to provide you with better service. If you have any questions about our reliable and affordable septic services and what they include, please don’t hesitate to give us a call. At Lee Kirk & Sons Septic, we are always more than happy to provide you with further information. Here at Lee Kirk & Sons Septic we offer quality septic services for customers in Central Florida, including Plant City, Winter Haven, Lakeland, Bartow, Brandon, East Tampa, Davenport, Polk County, Lakeland Highlands, and the surrounding cities. With over 50 years of experience, Lee Kirk & Sons Septic in Lakeland, Florida is Polk County’s #1 family owned & operated septic system installation business.